The University of California, Santa Cruz, celebrated its 47th year in 2011-12. With educating California’s citizenry and operating as a national center for research to address real world issues among its primary missions, UCSC was also responsible for an estimated $1.3 billion dollars of economic activity in the Santa Cruz regional area. Expenditures by the campus, its employees, students, and visitors totaled $632 million in 2011-12, most of which is spent in the region. 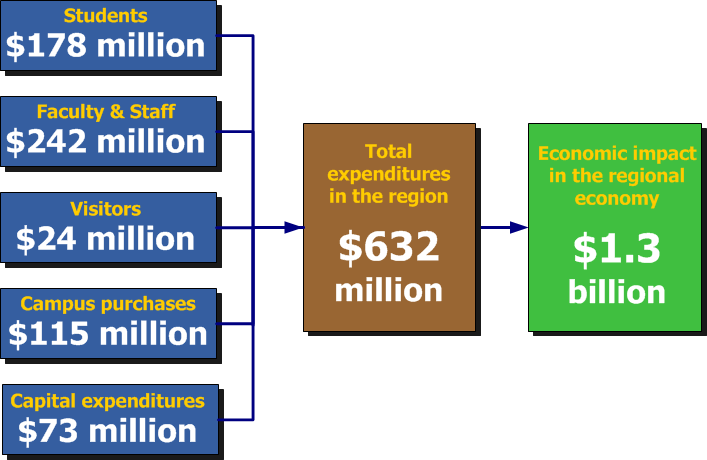 When calculated by an economic multiplier formula, the total regional expenditures increase to $1.3 billion. UCSC fuels the local economy through its purchases of supplies and materials and its construction, as well as through spending by households with members employed as faculty and staff at the University. Student and visitor spending associated with the University also accounts for a substantial impact to area retailers and restaurants. The full impact of UCSC spending in the regional economy is greater than the total of the University’s direct spending. This is because money spent by the University, students, and employees in the local community is spent again by local businesses and individuals receiving these dollars. In effect, the original dollars are spent and re-spent, creating a “multiplier” effect in the local economy. Direct University spending for supplies and services, including on-campus housing and food services, totaled $115 million while expenditures for capital items and construction was $73 million. Purchases made by University employees play a major role in the economic vitality of the community. In 2011-12, UCSC faculty, staff, and their immediate families spent an estimated $242 million on purchases and services in the Santa Cruz regional area. With 4,100 faculty and staff, UCSC is the top employer in Santa Cruz County—more than the next four largest employers combined. The campus employed 3,300 students. The 16,704 students at UCSC during 2011-12 spent $178 million (after payment of university tuition and fees). The results of a 2012 survey also show that 44% of all UCSC students participate in local community service and volunteer activities. The campus also attracts thousands of visitors each year, including prospective students and their parents; guests of faculty, staff, and students; and others attending conferences and special events. 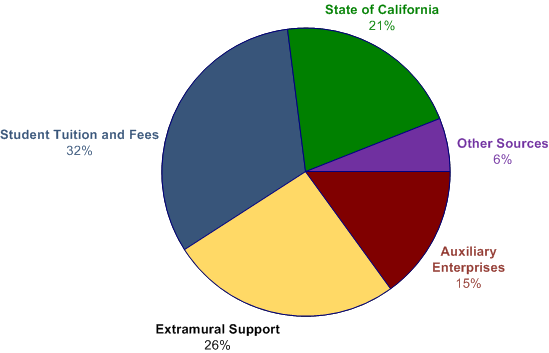 These visitors spent an estimated $24 million locally in 2011-12.
the form of, for example, State of California appropriations; extramural support—including Federal contracts and grants, private gifts, and endowments; student tuition and fees; and students/employees using their personal resources to purchase services from campus auxiliaries (residence halls, bookstore, parking, etc.). Thus, much of the money spent by the University represents new money to the community and generates new economic activity and jobs within the region that would otherwise not have occurred without the presence of the campus.